I RESPECT PARENTS, TEACHERS, FRIENDS! MATSU (4yr – 7yr) : The beginner class is for new and experienced karate students between the ages of four and seven years old. Students learn all the basic punches, blocks and kicks that make up the Tenshin-Kai system. In addition, they learn timing and coordination through specialized exercises and are introduced to basic karate katas or forms. TAKE (8yrs – 9 yrs): This is the class for slightly older students. Students learn all the basic punches, blocks and kicks that make up the Tenshin-Kai system, as well as katas or forms. Timing and coordination through specialized exercises are also stressed. Special rolling and diving techniques are perfected to help students avoid injury outside the dojo. UME (10yrs – 12yrs): Students learn all the basic punches, blocks and kicks that make up the Tenshin-Kai system, as well as katas or forms. Timing and coordination through specialized exercises are also stressed. Special rolling and diving techniques are perfected to help students avoid injury outside the dojo. 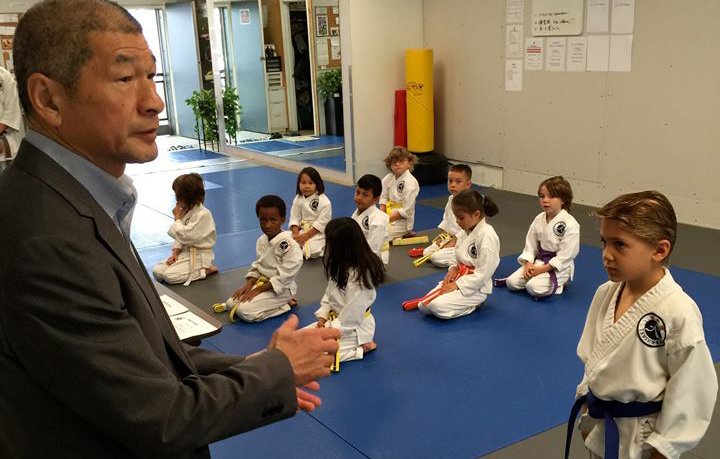 Students in this age range are also introduced to sparring under Kancho’s strict and watchful eye. EXAMINATIONS: Kids are tested on their skill and discipline several times a year. This is how they proceed up the Tenshin-kai belt system. Examinations are held at the dojo, and are a wonderful way for the parents to see how well their child is progressing.